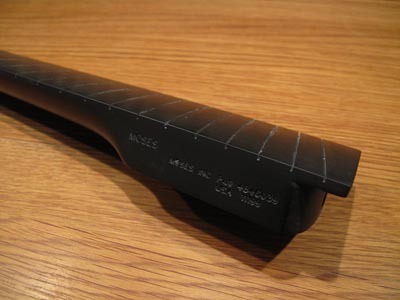 I have slotted and fretted the Moses Graphite neck over the weekend. Slotting the fingerboard was a pleasant experience. The material is easy to cut and there is no worry for chipping out, which is very nice. 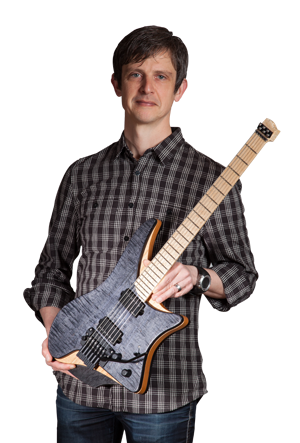 The frets still require dressing and polishing, but it was easy enough to do the fretting – no different from a regular neck. 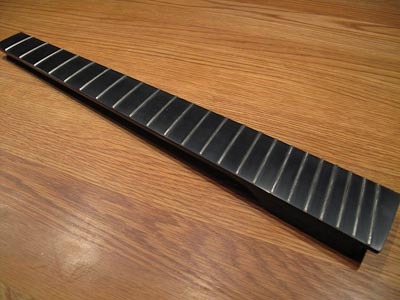 What was different, however, was that when filing off fret ends, planing them (which I do with a whetstone) and crowning them, there is no concern over dust or metal entering the wood. Again, very nice. My one concern is that I had to remove one fret and re-mount it. This turned out to be somewhat tricky because the tangs had already shaped the slot. I had to re-cut the replacement fret once to make it shift slightly sideways in position and move the tangs to a “fresh” place. I would hate to have this be a future re-fret problem. Having said that, I do believe that there are documented ways of doing it the right way to avoid these problems. If nothing else, Moses offer a re-fretting service. Next step is to cut the fingerboard to make room for the string locks and to dress and polish the frets. Then it’s ready for mounting.